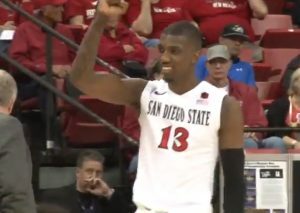 San Diego State made it to the semi-finals of the Mountain West tournament in Las Vegas Thursday, giving Utah State fits in a 73-39 runaway. 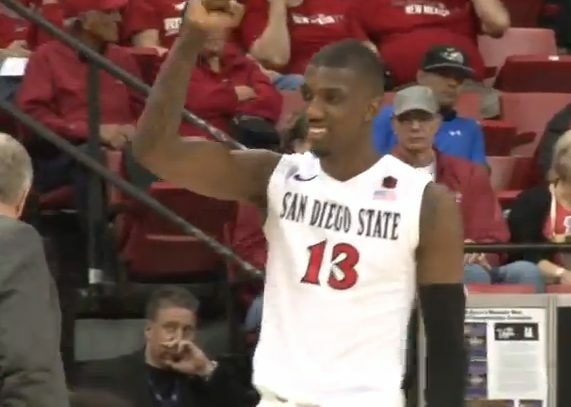 The Associated Press reports the Aztecs will face either UNLV or Wyoming Friday. San Diego State, AP said, flattened the Aggies to begin the second half by scoring the first six points, and following with a run in which they outscored their opponent by 13 points. Winston Shepard celebrates during San Diego State’s March 13 victory over Utah State. Photo credit: goaztecscom/YouTube. The NCAA Tournament starts next week.